The 8×8 entry level service plans work on two levels, firstly there is a choice of two service packs, Virtual Office or Virtual Office Pro. Then there are a choice of three service plans, Metered, Unlimited extensions, and Global Extensions. 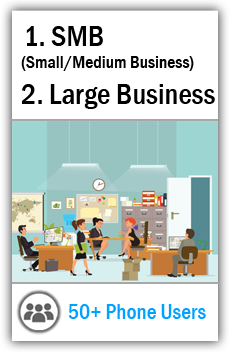 For the small home office or entrepreneur then Virtual Office combines with the metered extension may be the best fit. Virtual Office provides all the necessary features for the SoHo or entrepreneur including mobile apps for iPhone, iPad and android devices. There is also a softphone application for a PC, and integration with web based business applications for the like of Salesforce.com, Netsuite and Zendesk. Some of 8×8 web features include click to dial and business SMS, text and chat with presence detection. These are handy business applications to have in addition to the standard auto-attendant and call transfer features of a virtual phone system. With Virtual Office and a metered extension plan, you get 250 minutes to make calls in the US and Canada and addition minutes are billed at 2.9¢ per minute. The is also the unlimited extension plan which if you make a lot of calls may be a cheaper option as you can get unlimited calling to the US, Canada, Puerto Rico, Guam, US Virgin Islands, France, Ireland, Italy, Spain, and the United Kingdom. Summary: 8×8 is a feature rich virtual IP PBX service for businesses of all sizes. AXvoice’s Home Office plan starts at $14.99 per month and comes with only 200 free minutes but addition minutes are charged at 1.5¢ per minute and incoming calls are free. This is unusual because normally service providers do not differentiate between inbound or outbound calls and charge for both. AXvoice supports both incoming and outbound support, and has over 30 plus features in the home office plan. These features provide inbound functions such as do not disturb, anonymous call rejection, distinctive ring, conference and 3-way calling, and call waiting with caller ID. For the outbound functions, AXvoice provide features for caller ID blocking, International call blocking, alternate caller ID, simultaneous ring and music on hold. Additionally there is also a feature for 7, 10 and 11 digit dialing. Some other notable features that AXvoice provides are Find-me Follow-me, Failover where you can provide a number for calls to be forwarded to in the case of an internet failure, and BYOD support. There are also call logs and voicemail notifications via email as well as voicemail access via the web. AXvoice also provide a money back guarantee, and the service can be canceled at any time. Summary: AXvoice is a feature rich virtual IP PBX service for businesses of all sizes. The eVoice Professional service is designed for SoHo and entrepreneurs/freelancers and starts at $12.99 per month. The service plan includes 300 free minutes, 2 extensions and 6 numbers. Although there is a further 300 free minutes for every extra user. Any additional minutes used are billed at 3.9¢ per minute, which is quite high compared to the competition. The way the system works is that it is designed with the professional in mind that is always on the go. Therefore, eVoice provides a dedicated business number and handles all inbound calls to the number ensuring that calls never get missed. By using a dedicated number it also provides separation between personal and business calls which can be a problem on a mobile phone. The eVoice Professional plan provides either a local number or a Toll Free number for the business number and an auto attendant provides a professional, customized company greeting with menu options. The menu can be configured to project an image of a much larger company with extensions labeled as departments, for example press 1 for sales, 2 for Billing. Inbound calls can then be routed to either your home office phone or to your mobile, or both if you configure the find me follow me feature. Furthermore, eVoice has call forwarding rules that allow you to forward calls based upon rules such as the time of day, and these schedule based rules can be configured any time you want on the online web portal. There are many other features available such as call screening, voicemail transcriptions, music on hold, and audio conference calling. 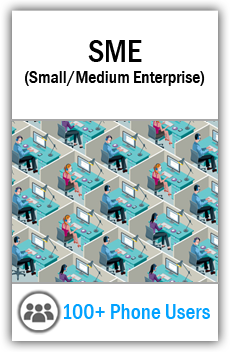 Summary: eVoice is an entry level virtual phone service for SoHo or one man businesses. Grasshopper virtual phone service has two entry-level products, the Pay as You Grow and the Ramp service plans. Pay as You Go, is the billed on minutes used and currently that is at 6¢ per minute, there is also a $12 per month subscription charge. Ramp, on the other hand is $24 per month, but you have 500 free calling minutes. Now what we have to remember here is that this is an inbound focused virtual telephone service, so these minutes are for received calls, not call you are going to me initiating. However, Grasshopper does offer a great virtual telephone service by providing a business number and answering service, which enables businesses to operate using their mobile phones. This is of course not unusual now, but the major differentiator between Grasshopper and most of their competitors is that Grasshopper utilizes the standard PSTN telephone network to transfer calls. This might explain why its call per minute charge is higher than most of its competitors but it also means that Grasshopper is very reliable and will not suffer from internet reliability issues. Grasshopper works by providing an inbound call answering service, and by using an auto-attendant it provides the caller with a professional greeting and a menu of configurable options. The menu can be made up of departments or extensions dependent on the organization, and each can be redirected to a different phone. A handy thing is a number of real phones can be linked to the virtual extension number, which can ring in sequence or simultaneously. Therefore, you could have your mobile as the first number and the house phone as the second, this way you can ensure you will not miss an important call. Summary: Grasshopper is a feature rich virtual phone service for small home businesses that enables you to run a business from a mobile phone. Nextiva’s entry level Plan Nextiva Office Pro starts from $19.95 a month with no setup fees. This entry level plan comes with most of the features and functions in Nextiva’s more expensive plans such as unlimited calling, free local and toll free numbers, unlimited virtual faxing and voicemail to email. There is also a voice-mail to text, which transcribes voicemails to text using voice recognition software and then forwards the text file via SMS or email. The way Nextiva works is there is an auto attendant, which plays customized greetings and presents the caller with an IVR menu so that they can chose the person or department they wish to talk too. Unfortunately, the standard Office Pro plan does not include mobile apps or call conference bridge, so you have to make do with 3-way calling. Additional features include a shared line appearance where a number of phones can be configured with a user’s extension number, this enables them to make and receive call on any of the phones. Another, handy feature is the call barge option which allows a manager to listen in on calls and take over if required, this can be useful during mentoring and staff training. Summary: Nextiva’s service is a unified communication IP/PBX service with wide set of features with unlimited minutes for the small business. Phone.com’s Base Plan starts at $9.99 and comes with 100 free minutes with additional minutes billed at 3.9¢ per minute. The Base plan covers a local or toll free number, unlimited users, a mobile app, and a whole array of other features. Phone.com’s service is built on High Definition voice in order to deliver the best call quality. However Phone.com doesn’t just use voice it also can offer alternative communications such as SMS and chat via the Chat Calls and Business messaging SMS features. There are also notable collaboration tools such as group messaging where you can initiate and moderate a group chat over SMS using the mobile app. Another communication media is Fax and that can be sent to voicemail for viewing, and printing or forwarded to email if preferred, either way faxes are now easily processed within Phone.com. Another great feature is the conference bridge that comes with each user extension and it can support up to 500 participants. As a moderator, you have access to over 15 voice control functions such as to record or mute, unmute participants, set entry or exit chimes, or to require name announcement during the call. Summary: Phone.com is a feature rich IP/PBX service with wide set of features at competitive pricing for the small home business. 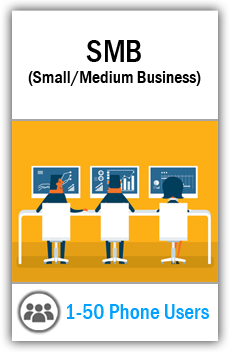 Phone powers Small Business Plan provides small businesses with a feature rich service with unlimited calling in the US and Canada. Phonepower Small Business Plan can be as little as $8.33 a month on a one year pre-pay contract or $19.99 per month on a non-contract basis. For a small business or entrepreneur, Phonepower offers many features, which include mobile apps for Apple and Android, fax support and a free cloned second line. Furthermore, you can keep an existing number free of charge and still have the cloned second line. Other notable features are, voicemail-to-email, 3-way conference calling, call blocking, simultaneous ring, which allows multiple phones to ring in the same way as find-me follow-me and works in conjunction with hunt groups. Additionally there is click-to-call, online voicemail viewer, and an online web portal for administration and reporting. What is more, the only thing that you need to get started is a broadband internet connection with a router that you have to plug the Phonepower adapter and your existing telephone into. If you have a PC, there is a softphone available and apps for mobiles so that you can use Phonepower even when you are away from the office. RingCentral Professional is a cloud based virtual telephone service designed for startups, entrepreneurs, and business people who are on the move. The Professional service plan delivers a solution for professionals that are heavily reliant on their mobile phones for business by providing an inbound call answering service. Because RingCentral Professional is an inbound service it lacks many of the features that its larger IP/PBX siblings offer but if all you require is a reliable inbound answering and call transfer service then Professional is probably what you are looking for. Just like other virtual telephone services Professional works by providing a business number for customers to call, this number can be local, toll free or you can port an existing number. The auto-attendant will always answer any inbound calls, which ensures you never miss a call and the configurable menu options allow calls to be redirected to a mobile or to any phone of your choosing. If you should be unavailable, then RingCentral will automatically divert the call through to voice-mail. RingCentral Professional is designed to be a feature rich, virtual telephone system, but it does lack out going capabilities that you may require for a business solution. However, if your chief concern is receiving business calls, or even faxes when you are out and about working from a mobile telephone then this service works great. Summary: Ring Central Professional is a feature rich virtual phone service for small home businesses. VirtualPBX’s Dash plan is priced at $15.99 for a single user, but that comes with 1,000 Shared Continental U.S./Canada & Toll-Free Minutes. There is also an additional 300 minutes for each additional user added. As with most service plans there are unlimited VoIP minutes between system users but untypically with VirtualPBX the first Local or Toll-Free Phone Number is included in the plan. VirtualPBX Dash plan works in the same way as most virtual phone systems by using an auto-attendant to answer any inbound calls. The auto-attendant plays a customizable greeting and presents the caller with an IVR menu. This configurable menu will contain the names, departments or extension numbers of the business. Calls are then transferred to a users phone however the user can configure several phones using the find-me follow-me configuration. By using find-me follow-me several phones can be rung simultaneously or in sequence, this is a good way to prevent missing calls if you are frequently away from your desk. 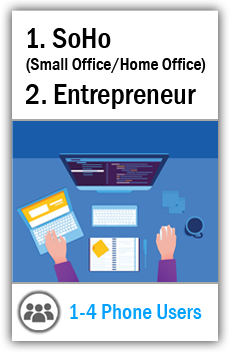 For the entrepreneur this is ideal as they typically work from a mobile phone and are often out of the home office. In addition to call answering and basic mobility, there are also audio conferencing and an email to fax service, which provides some other business functionality. Summary: VirtualPBX is a feature rich IP/PBX service with wide set of features at competitive pricing for the small business.